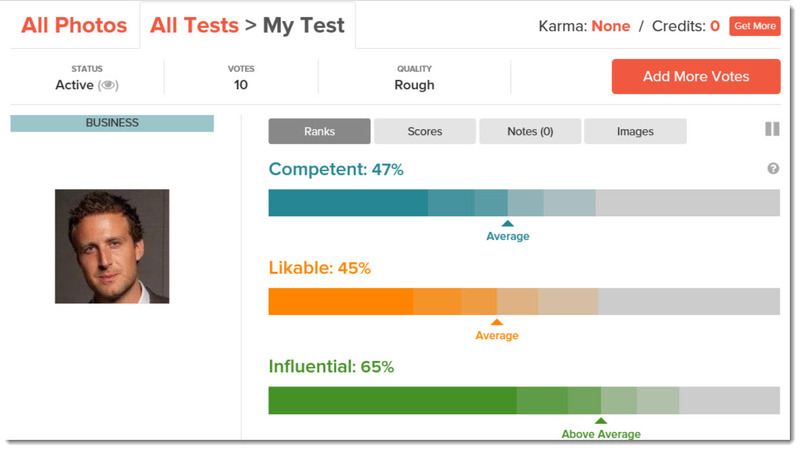 PhotoFeeler allows user to upload photos and receive unbiased feedback from other users on their perceived influence, likability and competence. Getting an honest opinion about your photos–whether or not you look approachable, likable, or any number of other desired perceptions–is more difficult than many might think. A lot of friends and family members are too “kind” to give you their honest opinion. A best friend may not tell you that your main Tinder photo is what is keeping you single, and a coworker or network acquaintance may not have the courage (or really the incentive) to tell you that your LinkedIn picture looks unprofessional (and maybe that’s why you’re struggling to find a job?). But what if you could ask total strangers to give you their honest opinion? A product called PhotoFeeler is helping you do just that. PhotoFeeler, a Colorado-based startup that has been around since 2013, allows user to upload photos of themselves and receive unbiased feedback from other random users. Users set up an account, upload one or more pictures, choose one of the three available category tests–Business, Social, Dating–and within a few days, the ratings start to flow in. Subscribing to the site is free and using it remains free (at least in principal) as long as you participate and provide feedback for others. Basically the more votes you submit on other people’s photos, the more feedback you get on your own photos. Each time you vote, your PhotoFeeler Karma level goes up, and your level bar begins to decrease as people vote on your pictures–the more Karma you have, the more votes you get. If you’d rather skip the whole voting part you could also choose to buy credits; pricing is between $0.13-$0.22 per credit. Users have the option to test for nine traits, 3 per category. Voters can also leave personal notes on images and can apply canned tag-based feedback such as: unprofessional, fake, forced smile. Users certainly have to be prepared for some constructive (or potentially destructive) criticism. Voters can also pick from a number of suggestions, which include: smile less, smile more, blurry, selfie, etc. Suggestions and feelings can be customized if voters have something unique they wish to express. According to the company, there is more to the product than just an unfettered forum for aesthetic feedback; there is intelligence running in the background as well. As stated on PhotoFeeler’s site, “advanced algorithms by Carnegie Mellon University Ph.D. mathematicians make PhotoFeeler a valid scientific tool.” The intelligence is designed to track vote quality, detect voter “fraud” and analyze scores to determine test accuracy. To be honest, we’re not quite sure what that all means. The system is not structured as a contest, so why anyone would ever join a 3rd party feedback loop only to have their friends privately boost their score is almost inconceivable. Also, what is “test accuracy” in the context of a platform driven by the expression of personal perception? Perhaps the biggest challenge for the algorithms is fending off trolls, scouring profiles dedicated to damaging the self-esteem of genuine participants. Other companies have tried to set up systems to rate photos, but most do not offer many options or suggestions. The app, Rate My Picture allows user to rate photos on a scale from 1-10, nothing fancy. You can also chose to chat and message a person though; that’s probably pretty annoying for those simply looking for quick feedback on a photo, and seems dangerously close to a dating app in disguise. What’s better than unbiased feedback? Time-limited unbiased feedback 🙂 LookSeeFirstImpressions.com – doing it since 2012. I think that you could get some real good feedback from a system like this. Even if the trolls get all over the place in there, you can just real them out and still get some new, good feedback. Getting an algorithm that can figure out what is a troll online and what is not would be making someone millions of dollars at this point. I like the system, but as mentioned here, the trolls would ruin it. Very nice. We could all use an unbiased look at things. Well, the minute you are connected to the internet, this is not possible any more. I am cool with an unbiased look at a photo of myself. Being online, there is always that thought of friends being too nice and trolls being trolls. Thanks for the link.